Research has shown functional connectivity between certain parts of the brain in those suffering from depression. New research identifies the neural link between depression and sleep problems. The researchers found functional connectivity between the areas of the brain associated with short-term memory, self, and negative emotions, which cause sufferers to dwell on bad thoughts and lead to a poor quality of sleep. Depression and sleep problems often go hand-in-hand. About 75 percent of depressed patients report significant levels of sleep disturbance, such as difficulty of falling asleep and short duration of sleep (insomnia). People with insomnia also have a higher risk of developing depression and anxiety than those who sleep normally. Analyzing data from around 10,000 people, the researchers examined the neural mechanisms underlying the relation between depression and quality of sleep. In the brains of those living with depressive problems, they discovered a strong connection between the dorsolateral prefrontal cortex (associated with short-term memory), the precuneus (associated with the self), and the lateral orbitofrontal cortex (associated with negative emotion). “… this results in increased ruminating thoughts which are at least part of the mechanism that impairs sleep quality,” says Jianfeng Feng, professor in the University of Warwick’s computer science department. 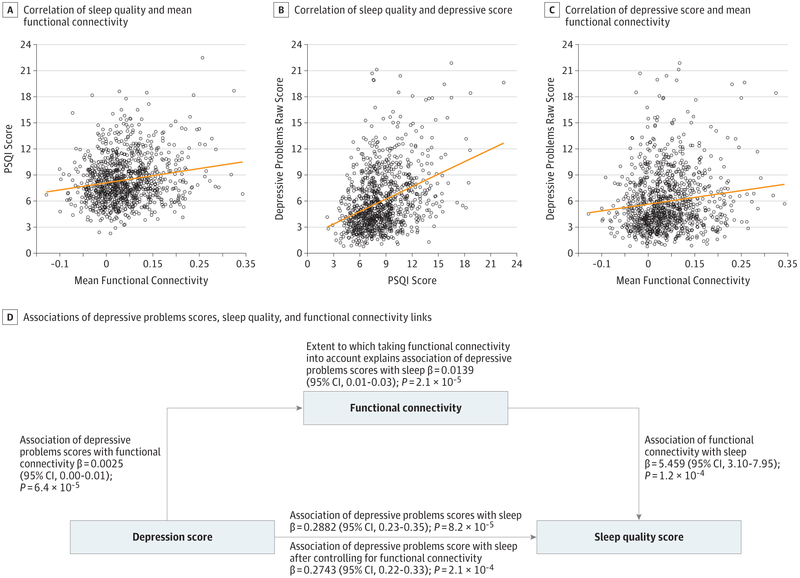 The researchers conclude that increased functional connectivity among these brain regions provides a neural basis for how depression is related to poor sleep quality. Feng comments that these findings could have important public health implications, as both sleep problems and depression affect a large number of people. “In today’s world, poor sleep and sleep deprivation have become common problem affecting more than a third of the world’s population due to the longer work hours and commuting times, later night activity, and increased dependency on electronics. The findings appear in JAMA Psychiatry. The third coauthor of the study is Wei Cheng from Fudan University in China.